Posted on May 28, 2015 by academicbookfuture	in libraries, Wales and tagged engagement, haiku, World Book Day. Today’s guest post is by PhD researcher and librarian Kit Kapphahn. She talks about the importance of the library/user relationship, and how Aberystwyth University Library used the recent World Book Day as an opportunity to strengthen and celebrate this relationship and further engage its community of readers, both digitally and within the physical space of the library. Aberystwyth’s library has a great relationship with the students and staff at the university and we’re always looking for new ways to foster engagement with our users. Jamie Harris, one of the three masterminds behind the haiku contest, said, ‘We have conducted temporary feedback harvests before and found our library users, both students and staff, to be quite witty and keen to engage with us, so thought it would be interesting to see if they could harness this in the form of a poem about the library.’ Of course, offering cake is always a good incentive too! 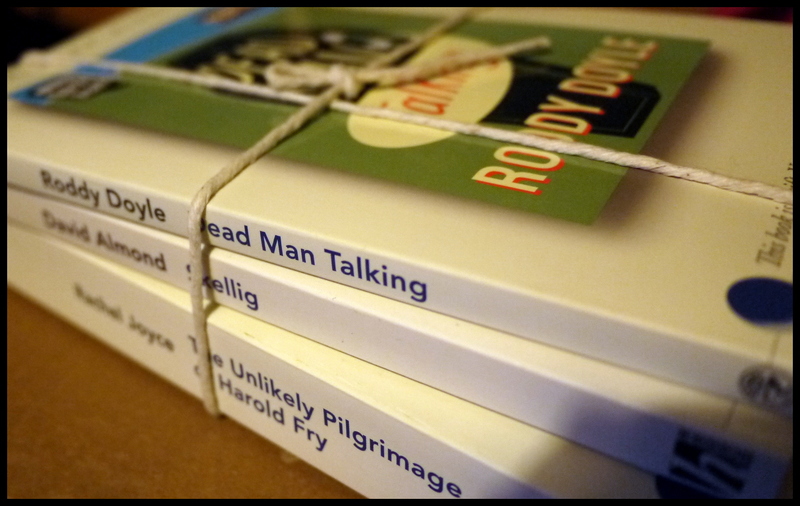 Book prizes for the competition winners. Credit: Kit Kapphahn. The day itself fell in the middle of undergraduate dissertation deadlines in several departments, so the library was a busy and electric place already. The timing may have contributed to the atmosphere – students could drop off or pick up a bound dissertation, write a haiku to calm their thoughts, and celebrate with cake! There were also a few people who came in specifically to take part, having seen it advertised around the campus, and still more submitted via Twitter under the hashtags #haikuaber and #haicwaber. We awarded prizes in two categories – English and Welsh – and guessed we’d get quite a few entries in both. But those weren’t the only languages involved, since we also received several submissions in French and one in Korean (and one in Latin, but that was mine – I’d just come out of a reading group where we’d been doing Reginald of Canterbury so it was fresh in my mind). All told we had around ninety entries and went through several large sheet cakes – the biggest challenge, according to the judges, was deciding between so many great entries. That wasn’t the only entry to deal with the physicality of books – some used the forum to discuss the authority of books over Wikipedia or to bemoan the sleep-deprived student lifestyle. Some entries reflected a clear love affair with books and libraries that reminds us how important these spaces are to students in a way that can’t be replaced entirely by online resources. I shall pay my fines! And I want free cake. University libraries face many challenges at the moment. Budgets are under threat, journal subscriptions are extremely high, and staff and resources are being cut or not replaced. What this really showed us, along with how wonderfully clever our students are, is how eager the academic community is to be involved and engaged with the library, and how important it is to them. It’s more than a collection of facilities or a computer room, but an integral part of the university experience and something they value. We get a lot of feedback from our students and staff because we encourage it – whether they have suggestions, complaints, or praise (and we get plenty of all three) we want to hear it. The praise makes us feel good, of course, but we also know we can’t address any concerns we don’t know about. I’m occupying the middle ground, being both a postgraduate researcher and library staff, and often try to be an ambassador for both sides. This is definitely made easier by the willingness of the library staff to really listen to student feedback! It results in a feeling of partnership as we all work toward the common goal of providing the best experience possible. When librarians and students (and those of us who are both) feel that we’re all on the same side, it makes it easier to keep going in the right direction. It also makes for a lot of spontaneous poetry – and cake! Take a look at the winners and all the haiku entries at http://www.aber.ac.uk/en/is/news/wbd/. 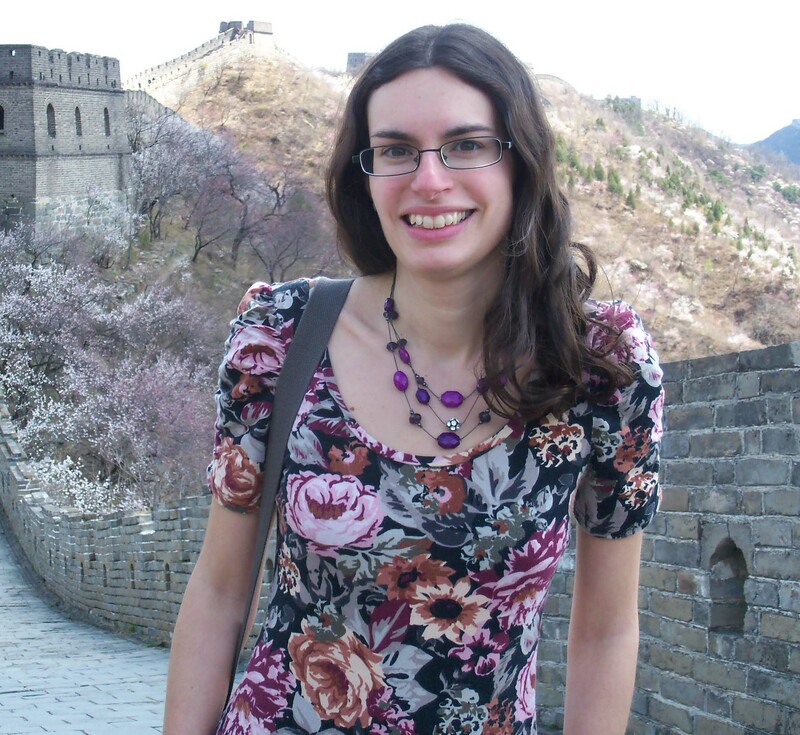 Kit Kapphahn is a PhD researcher and librarian at Aberystwyth University, focusing on gender and genre in medieval Welsh Arthurian literature. She is also the English-language winner of the Aberystwyth World Book Day haiku contest, which is probably the only poetry award she will ever win. She is on Twitter as @aelura. The Bookshops of New York Fight Back! Posted on May 26, 2015 by academicbookfuture	in academic books, booksellers and tagged bookstores, retro, United States. Project Team member Marilyn Deegan has been in New York recently speaking about The Academic Book of the Future Project. In this post she writes about the bookshops she saw there, the ways in which they hybridised the physical and digital, and the implications this might have for the ways that we think about academic books. I’ve always been a lover of bookshops, but have increasingly become a reader on Kindle—either the dedicated device or on my smartphone. Living in France, English language books are expensive and limited, and at first (I have been there 10 years) I ordered printed books online, now for many books (especially crime fiction), I download them. I find, however, that there are certain books that I can browse on Kindle, but can’t actually read in depth: cookery books (a passion of mine) and serious academic books. I find that the need to flip around an academic book, looking at the table of contents, index, maybe not reading in a linear sequence doesn’t work well on devices. Odd—in the early 90s the printed book was rejected as too linear, and the digital and hypertext were to save us from the tyranny of linearity. Barnes & Noble, Union Square, NY. Credit: Wikimedia Commons, Beyond My Ken. So last Saturday morning I was wandering round New York in a bit of a jetlagged fog, and went into Barnes and Noble in Union Square. The big Barnes and Noble on 6th Avenue used to be one of my favourite bookshops in all the world (well, after Foyles in London), but sadly it closed down and the space became a shop selling storage solutions. 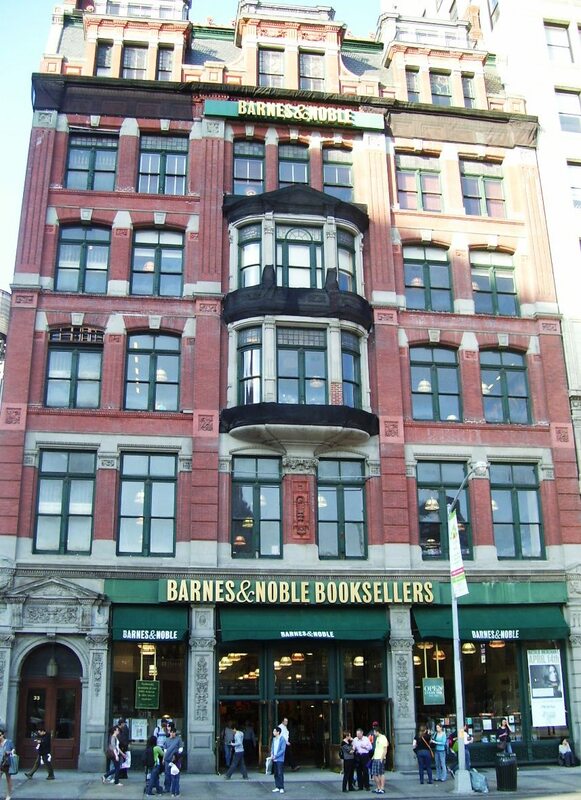 Barnes and Noble, which advertises itself as the world’s largest bookseller is the last book-selling chain left standing in the US, and is managing to keep afloat despite the onslaught of online booksellers, notably Amazon, with a range of creative commercial moves aimed at diversifying the selling of books and associated products. Is there anywhere more eclectic than a large general bookshop? Everything from Kierkegaad to Winnie the Pooh is there. What struck me about Barnes and Noble was that they have embraced all the possible routes to sustainability in the selling of books in all their myriad forms. In print form, they sell general books, academic books, children’s books, new books, second-hand books, magazines, and they even offer a print-on-demand service: if it is available anywhere in the world (copyright permitting), in a few moments you can get a printed, perfect-bound paperback copy from their Espresso Book Machine. You can also print your own, self-published books. They claim to search through ‘millions of foreign-language, small-press and out-of-print titles’ to find just what you are looking for. Barnes and Noble, too, have entered the world of the ebook reader with their dedicated Nook device and Nook app that can be used on any smartphone or tablet. There is a large corner display for the Nook and Nook-related products (a Nook-nook? ): ‘your endless escape to four million books, movies, apps and more’. Besides books, Barnes and Noble also sell a huge range of book-related products: bookmarks, reading glasses, posters, postcards, tote bags, mugs, chocolate, and many more quirky artefacts; as well, they have a large café and a lecture area for hosting events. And of course they have a huge online presence (http://www.barnesandnoble.com/). Strand Bookstore. Credit: Wikimedia Commons, Postdif. 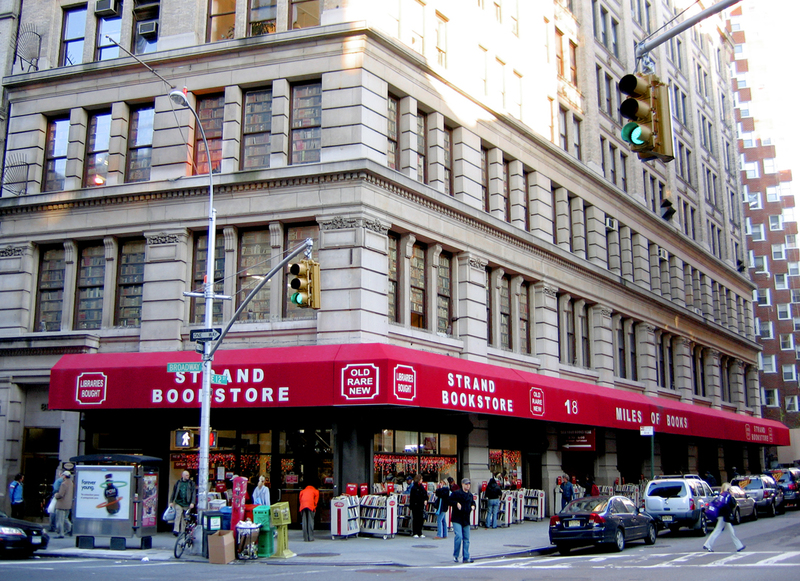 Fast forward to Tuesday morning and Strand Bookstore on 10th Avenue: an independent, family-run book shop, 85 years old and with 18 miles of books. How are they weathering the publishing and bookselling storms? Well, the first thing to greet me when I walked in was a huge poster announcing for sale ‘Real books priced lower than ebooks’ in huge letters, and then in smaller letters below ‘Fact: unlike an ebook a real book may be resold or given as a gift’. Interesting—the distinction is not ebook vs printed book, but ebook vs ‘real’ book, an interesting definition for us to ponder. When is a book not a ‘real’ book? When it’s an ebook? This is one bookseller’s perception—is it a reader perception and do we need to interrogate this? 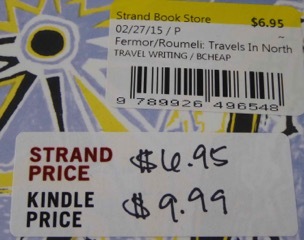 ‘Real’ book vs ebook prices. Credit: Marilyn Deegan. 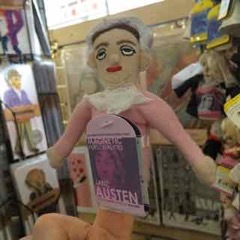 Jane Austen finger puppet. Credit: Marilyn Deegan. Wednesday morning and I am in the bookstore at the New York Public Library—the Readers and Writers Shop. All the books here are new, again there is a huge range of book-related artefacts (many very specifically library-related) and there is a range of retro writing tools: elaborately decorated (and expensive) notebooks; pen and ink sets; desk accessories. My favourite is the Windsor Travel Pen Set (http://www.thelibraryshop.org/AUTHENTIC-MODELS-Windsor-Travel-Pen-Set-41641) ‘For the traditionalist on the go, this wooden box contains two wooden styluses, two bottles of ink, and a variety of nibs. Storage compartments are lined with marble paper.’ Who, I wonder, actually uses something like this? Who is this ‘traditionalist on the go’? The heartening thing in these book shop visits was that all of them were crowded and obviously doing a brisk trade. Another thing that I noticed (and not just in book shops) was the rise of the retro: notebooks, pens, print artefacts, but also lots of shops selling vinyl records and turntables, and cafes with turntables and scratchy records; and a whole range of different kinds of film cameras available everywhere. The relevance of this to the academic book of the future is the hybridness of digital and material objects. Many material things of course can never be digital, but of those that can (texts, music, images), there seems to be a move back to the physical. Posted on May 6, 2015 by academicbookfuture	in academic books, Publishers and tagged book art. 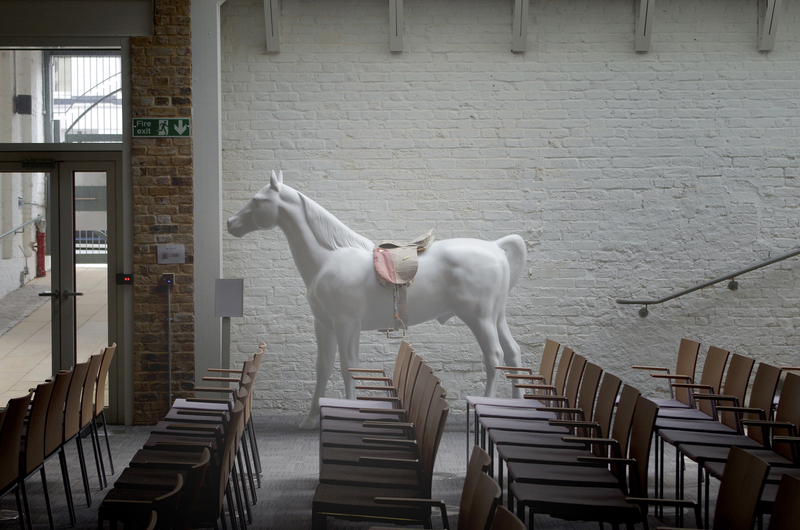 Saddletree in the new conference room – housed in former stables at Palgrave’s ‘London campus’. Palgrave Macmillan, Macmillan Education, and Nature Publishing Group (together, Macmillan Science and Education) came together from their offices in Oxford, Basingstoke and London, last year, to take up residence in the ‘London Campus’, making it far easier to share ideas and explore new opportunities in the rapidly changing publishing environment. 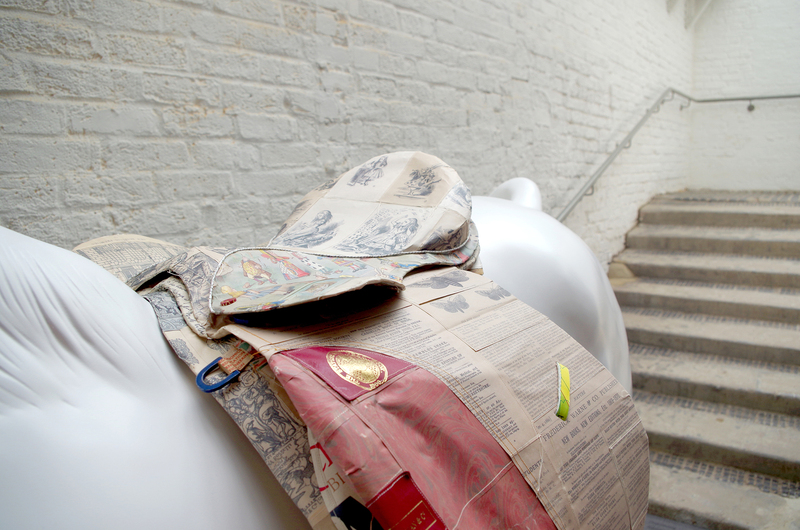 Saddletree was commissioned by our design team and was chosen to clothe the life-sized statue of a horse, which takes pride of place in conference space of our new home – a former stables. We wanted to celebrate our coming together as a group in the new Campus through the beauty of our printed products. The archive materials used to create the saddle were chosen carefully with the Macmillan Archivist’s help to represent the different divisions of our company and were merged together to create a single object, thus becoming more than the sum of their parts. The piece itself was created by Su Blackwell, an artist who works predominantly within the realm of paper. 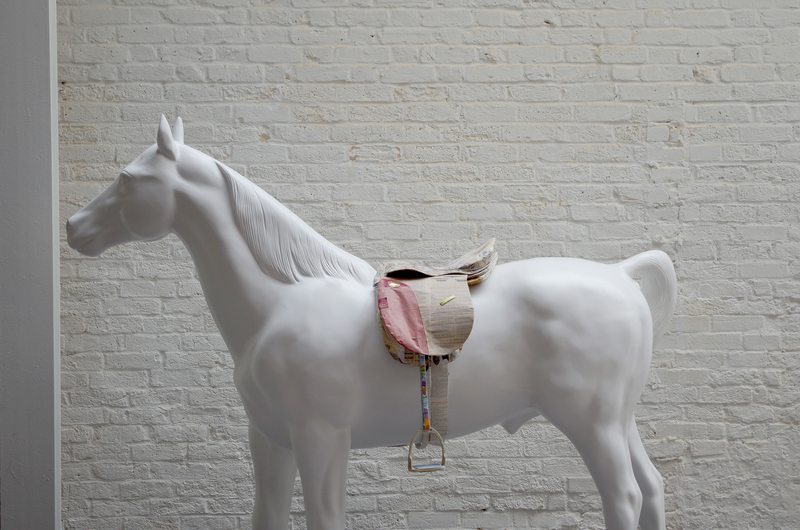 Su studied the structure of a real leather saddle and the traditional methods used to create it. She then replicated those techniques using sheets of vintage paper which she printed our scanned archive materials on. The detail on the saddle is quite beautiful. To read more about Su’s process take a look at her blog post: Su Blackwell Studio Blog: Saddle Tree: A Commission for Macmillan Science and Education. Posted on May 1, 2015 by academicbookfuture	in About the project, academic books, STM publishing and tagged Cambridge University Press, medical publishing, Nisha Doshi. As a commissioning editor of medical books with an academic background in the humanities, I’ve been very interested to follow the work of the Academic Book of the Future project. While this project is identifying and exploring important questions of relevance to scholarly book publishing as a whole, its focus on arts and humanities publishing has given me the opportunity to think about STM (and particularly medical) books publishing from different perspectives. Answers to many of the project’s research questions might apply regardless of a book’s subject matter, while others are likely to be radically different in different disciplines, and in some cases we face very different if not completely contrasting challenges in STM compared with arts and humanities book publishing. This has prompted me to give some thought to questions such as ‘what is a book’ and ‘what is the role of an academic book publisher’ in the context of both medical and broader academic book publishing. Our authors and readers are facing increasing pressures on their time, coupled with the need to publish their work in high-impact journals (however defined), while the volume of published books continues to grow. This statement could perhaps characterise any subject area. However, while potential authors in humanities subjects still very much want to write books (in a 2014 OAPEN-UK survey, 95% of respondents in the humanities and 72% of respondents in the social sciences considered it ‘important’ or ‘very important’ to publish a monograph), the opposite is increasingly true of many medical specialties. Immediately therefore, the role of a commissioning editor and a publisher of medical books is very different from one in history, for example. A large part of my job involves persuading potential authors that it is still worth their while writing or editing books (print and/or ebooks) and chapters. I would therefore argue that to stay relevant and competitive as a medical/STM books publisher, it is essential that we have answers to questions such as: How can we improve our abilities to demonstrate the value of writing or editing books (and related digital products) to potential authors? Related to this and perhaps more importantly, how can we improve the ways in which we demonstrate the ‘impact’ of published books, both qualitatively and quantitatively? The topic of impact has of course been debated in journals publishing for some time, and there is much we can learn from this as book publishers. I was particularly interested to learn of the recent Bookmetrix venture between Altmetric and Springer. However, I don’t think we can simply import journals-originated measures of impact without considering the challenges posed by the persistence of print in much of books publishing. We can measure print sales, of course, but how do we measure or demonstrate the impact of a print book or chapter referred to daily in clinical practice as opposed to one sitting on a shelf, collecting dust? Can we go beyond reviews, anecdotes and reputation to objectively measure the impact of books, both print and e? Another issue arising in journals publishing is the place for datasets and code (open or otherwise). For example, the University of Minnesota Press has recently announced a new platform which will provide access to primary research documents and data alongside digital books. Should we redefine the medical/STM/academic book to include primary data or instead should the book serve a different role, synthesising data and evidence with accompanying authoritative commentary and guidance? And what about other media formats? For many years, medical publishers (including Cambridge University Press) have been packaging videos with our books. It now almost goes without saying that printed medical books are packaged with online access to the book’s content, often supplemented by extra online content. Video content demonstrating ultrasound-guided regional anaesthesia is just one example from a medical specialty I work with, and we would certainly define this content as part of a ‘book’. The same applies for animations, interactive self-assessment questions, audio clips… How far do we take this, though? Would a set of video tutorial ‘chapters’ still be a ‘book’? Does it matter what we call the product, so long as it serves the needs of our users (and sells well, from a commercial perspective)? As text and images are increasingly joined or even replaced by other forms of content, our ‘products’, roles and workflows are evolving rapidly while our core goals and audiences often remain the same. On the subject of our target audience, I often read and hear about the challenge of moving from sales and marketing activities and business models targeted at institutions, to those targeted at individual users. For ‘professional’ publishing such as Cambridge University Press’ medical books programme, this is perhaps less of a new concept than it might be for other areas, since our books have always been aimed primarily at individual medical professionals or trainees. It often surprises me that the importance of understanding the needs of individual researchers, clinicians, students or educators remains a topic worthy of comment at academic publishing events – surely this is already fundamental to the work we do every day as commissioning editors. Increasingly, and again echoing journals publishing, the question of open access is rarely far from our minds when we consider the future of the academic book. So far in books publishing, this debate and associated new ventures have tended to focus on monographs, for example Cambridge University Press’ open access monograph publishing service. The growth of the ‘free open access medical education’ movement (FOAM or FOAMed) has seen an explosion of freely available educational blogs, podcasts, tweets, videos, text and much more content, particularly in emergency medicine and critical care; much of this overlaps with educational and clinical content traditionally found in books, competing for the time and attention of our authors and readers. All of this makes it even more important that we as medical book publishers define and redefine our products, our role and our business models. Lastly, moving from the familiar lifecycles of print editions to continuously or regularly updated digital books brings further challenges and opportunities, including very practical issues such as version control (discussed in detail here), workflows and, returning to where I started, pressures on the time of both authors and publishing staff. There are of course many other topics and questions that I have not addressed here, including increased flexibility with the size and length of ‘book’ content afforded by digital publishing, repurposing chunks of existing content into new or personalised ‘books’ and products, peer review as applied to book publishing, subscription and many other sales models – to name but a few. How far should we take all of these opportunities and models, and might we risk undermining some of the strengths of the ‘book’ as a coherent whole and intentionally designed package of valuable and authoritative content, as we attempt to redefine the book to encompass or compete with a plethora of formats and publishing models? This blog post is not an attempt to provide answers to the questions and challenges facing us in medical or academic book publishing, nor am I claiming to say anything that has not been said before. I hope that it serves simply to outline some of the challenges and opportunities facing us as we strive to provide attractive products and services for our authors and readers, as I see them at present. I very much hope to have the opportunity to explore some of these and other questions further with the Academic Book of the Future project and would love to hear the thoughts of others.